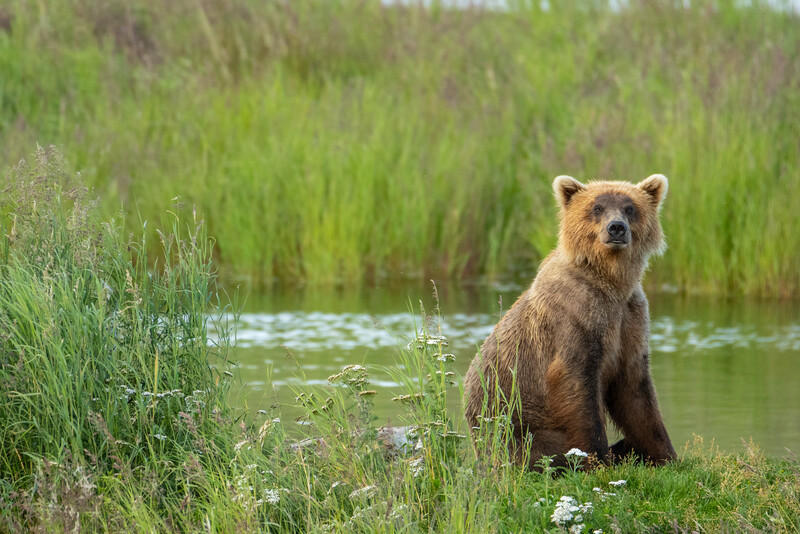 Fast-forward 7 months to the end of July, and the bear cams were still showing plenty of activity – great news! The night before Travel Day, I started the drive up to Bozeman, staying at a campground 1hr south of town. It was better than leaving Jackson at 2am. I reserved a spot at Greek Creek CG because it was right on the highway…just need to pull off and sleep, then finish the last hour to the airport in the morning. Only word of caution with this campground is that the highway noise is pretty bad. There were even some trucks using engine braking through the canyon. I suppose if you slept in your vehicle or hard-sided unit, it wouldn’t be so bad. But for me that certainly wasn’t a full night’s rest. Wake-up time is 4am today. I still have 1hr driving time to Bozeman Airport for my 7am flight. The day’s flight schedule is BZN -> SEA -> ANC -> AKN -> Brooks Camp. All air travel was able to be completed in 1 day, although drifting west makes it a very long day. The float plane is last in the day’s round of flights. Here I met Cody, a lone traveler that decided to take a spontaneous trip for a few days. He will join up with Tim and myself for the first half of our trip. The float plane landed in Brooks Camp by 7pm. Before anything else, there is the bear talk and campground check-in. Everyone is required to attend a ranger talk to make sure we understand bear safety. 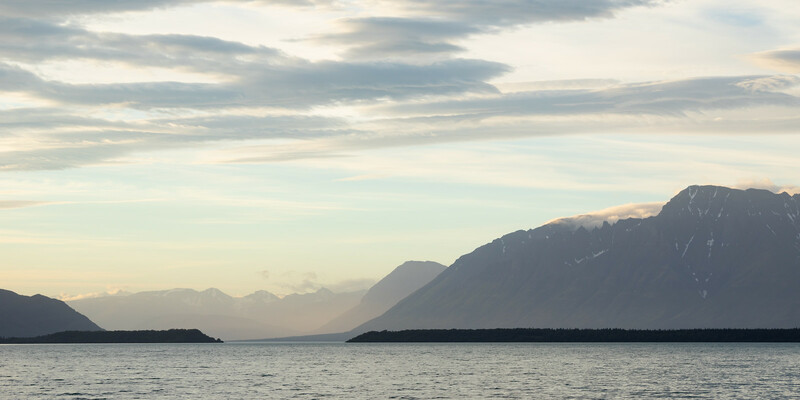 Of course the summer Alaskan sun sets…basically never, so there is still plenty of time to setup camp and explore. Easily the most iconic location in the park, this is where you get “the shot”. I only spent maybe an hour or so at the falls before succumbing to my travel exhaustion. I have a whole week for this, no need to stay out all night. The day started off with pleasant weather, we headed to the falls early in the morning…turns out it’s not the best time when it’s sunny. The falls platform faces directly into the morning sun, with no other angles. Towards noon the light can still be harsh and worse, the crowds can be intense with day-trippers around. I’m not talking Yellowstone-level crowds, but know that the platform can only hold 40 people at a time. Given how much time I have here, it’s best to stay away from the coveted spots during the day – I’ll come back in the evenings. So it’s time to move to the lower river area, where there is better use of the morning light. 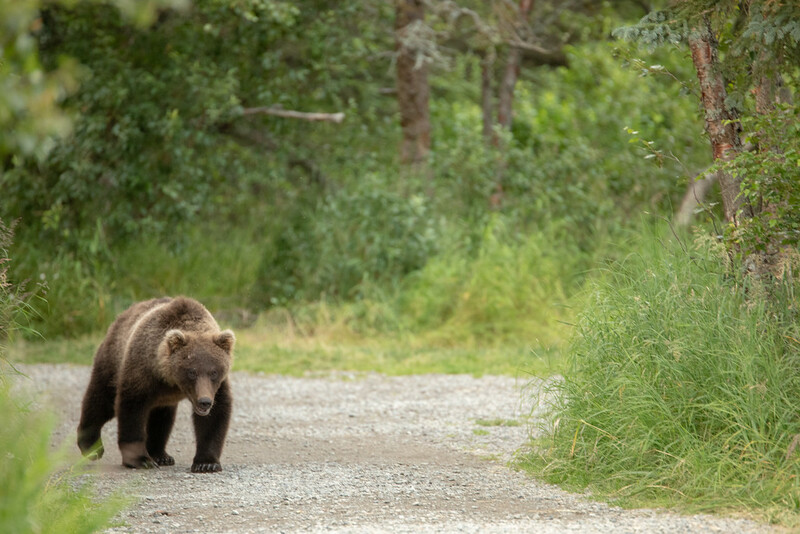 We were just in time for bear 435 and her cubs wondering the trail. She will fish somewhat lazily and frequently find dead scraps. 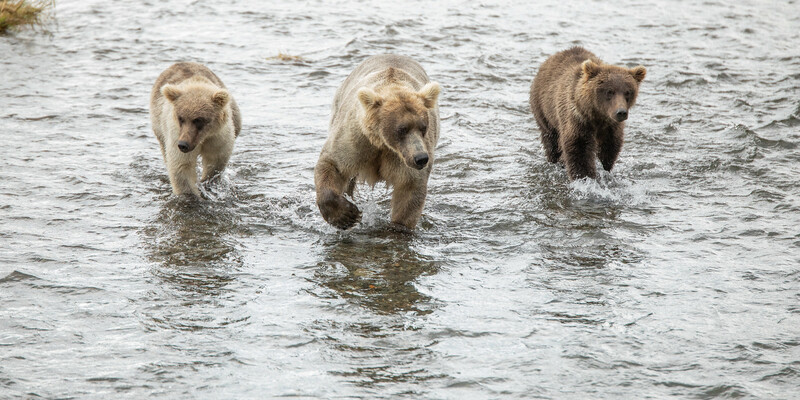 When she does, her cubs show up looking for a free sample. Lower River is my favorite spot around camp, even compared to the falls. This is because we don’t have to stick to the elevated platforms. 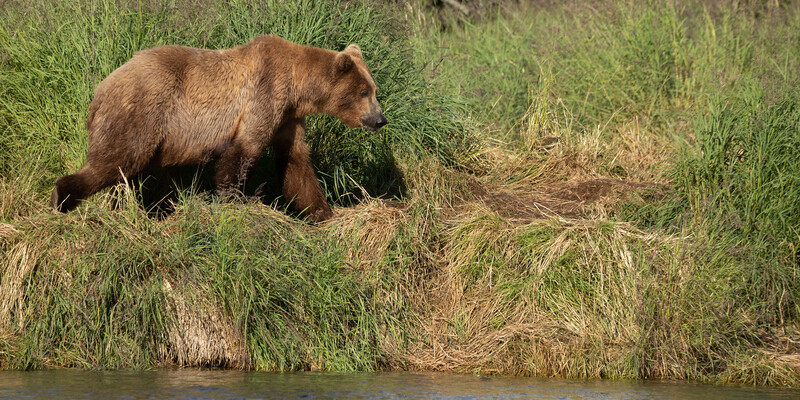 As long as the bears are a safe distance away, I can be right on the river bank, eye-level with them. This allows better isolation from the background and a visible horizon (even if it’s just a junction from river to land). The activity continued through midday. At some point, I took a break for lunch and came back out early afternoon. We headed to the falls for the evening at around 6:30. This was when we encountered our first trail bear. 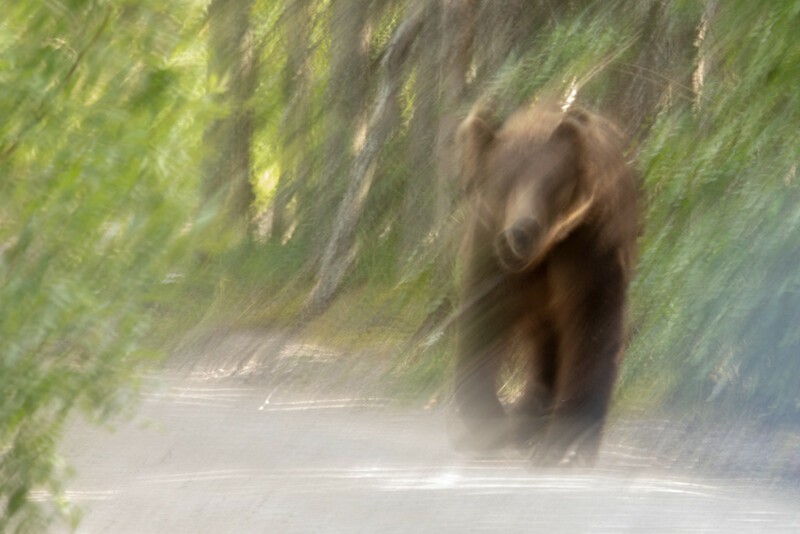 This is something that happens quite a bit when hiking with my camera. The aperture dial will rub against my hip and unknowingly bump it up to f/32. When shooting in aperture priority mode, that brings the shutter speed down to something ridiculous like 1sec or slower. With a bear coming directly at us, I quickly raise the camera and fire a shot only to hear the disappointingly slow click…..click of the shutter. After a frantic flick of the aperture dial, it’s back to f/6.3 with enough time for another few photos. As you can see the bear is looking right at us so knows we are here. Best thing to do now is take a step off the trail and let him pass. Turns out the bear took a detour through the marsh so didn’t even get too close. 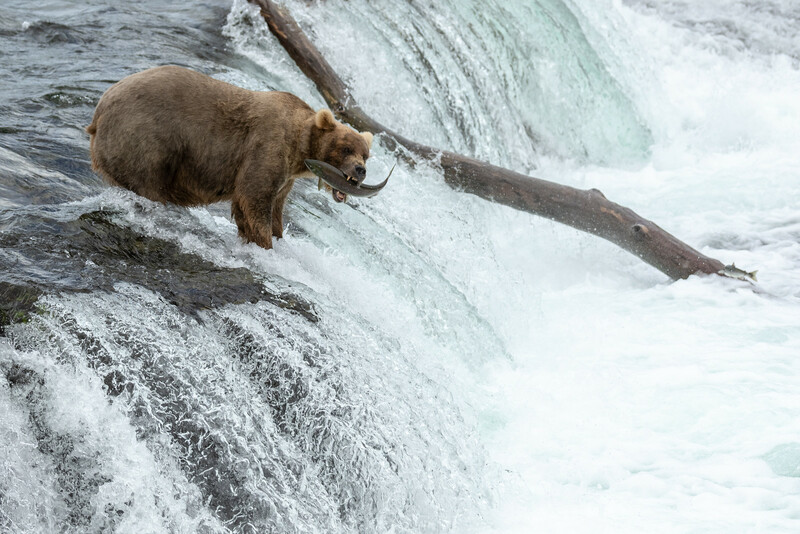 At the falls there were the usual fishing culprits. 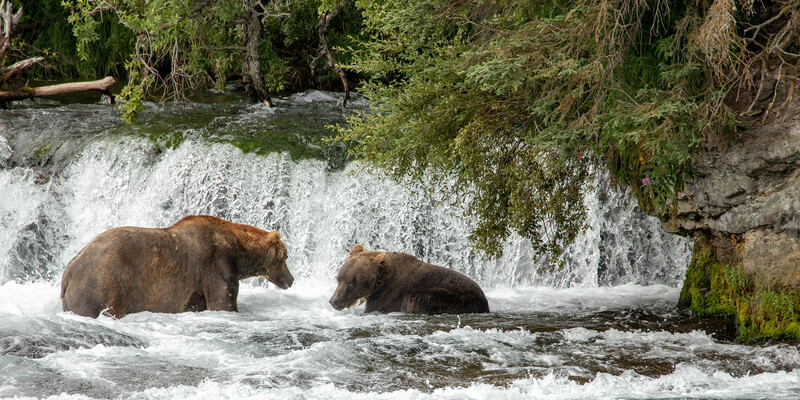 There were a couple bears taking turns at the top of the falls. One of them had a really photogenic way of eating his dinner. In the back of my mind I was recalling the wolf that was spotted on the bear cam several days earlier. It looked like a skittish female that only came out late – probably when people were gone. It didn’t take long after that thought for someone to cry wolf. It was seen way downriver, but heading this way. Getting the shot sometimes requires anticipating the animal’s movement a little bit. 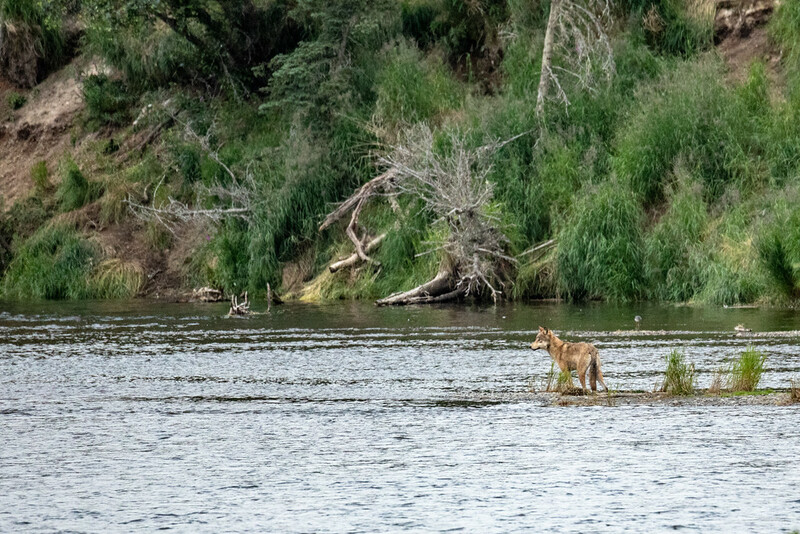 Well if the wolf is heading upriver, I want to meet it away from the falls platform. I headed to the “riffles” platform (which was void of people given how late it was), pointed my lens down-river and waited. 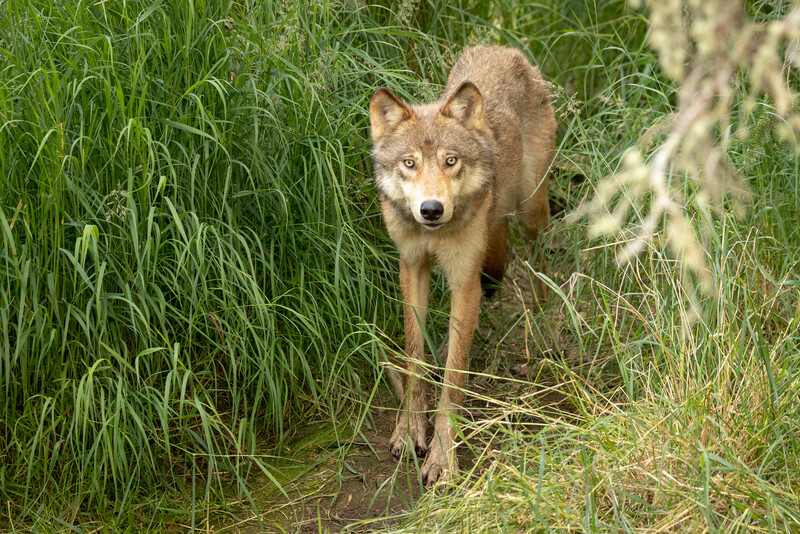 It took maybe 20 minutes before I saw a rustle in the brush, and then out pops the wolf. The mere sound of my shutter froze her in her tracks. Then after a brief pause she retreated to fish down river and then out of sight. This photo also shows why the platforms aren’t my favorite – looking down on the animal with no horizon in the background. But I nit-pick. We head back for the night at around 10:30pm. The weather started off cloudy with a few peaks of sun in the afternoon. This morning we hang at the lower river once again. The first shot of the day is my favorite B&W photo of the trip. We hang around the lower platform waiting for bears to pass by. This particular morning we had a couple sub-adults pass by and had quite the sparring session right under the platform. It was even close enough to break out the 70-200. As the morning moved along, two sow/cub families passed by, including bear 435 “Holly” and her cubs. After lunch, we headed back to camp, unloaded memory cards, and headed back out for the afternoon. There was plenty of activity in the early afternoon. We headed to the falls around 5:30 as the last of the day-trippers were heading back. This evening provided a ridiculous amount of activity at the falls. Even though I was there, the photo still doesn’t look real. I count at least 20 bears here, but it got to the point where I wouldn’t bother to count. Some people counted as high as 30 if you include the ones down-river. 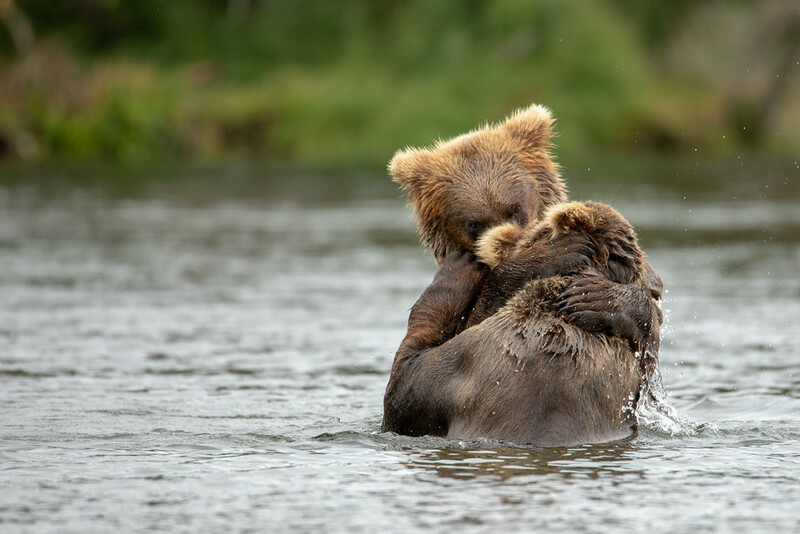 Everyone was here tonight – old males, sub-adults and families w/ cubs. Even the 435 family showed up looking like they were about to own the river. The most interesting interaction this evening was this other family I remember from last year. 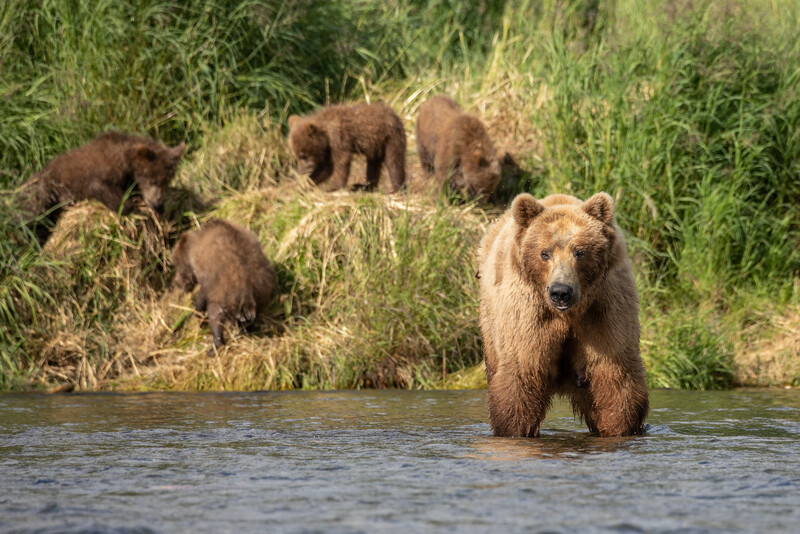 (Self-note to try to identify this family in the ebook) This was the family I remember last year that had extremely vocal cubs when feeding, except for the little runt that seemed to watch from the background. 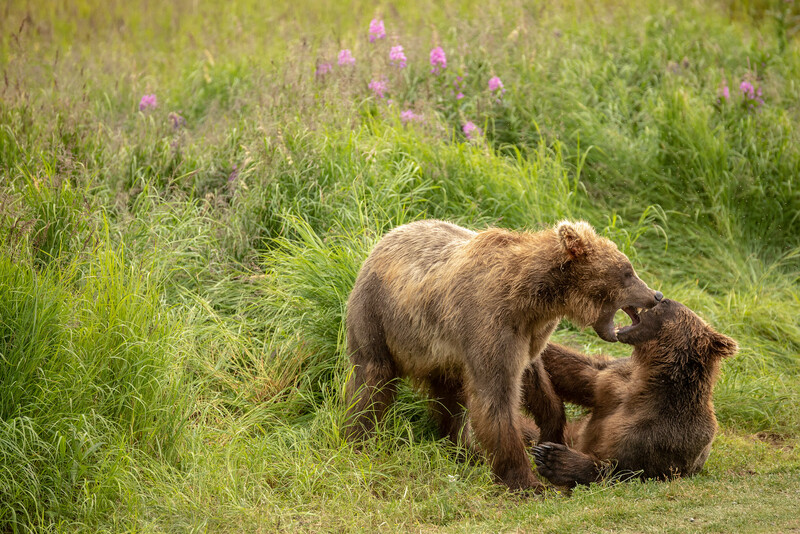 The mother expressed a strange begging behavior, even provoking other bears to a fight, as long as that causes them to drop their catch. 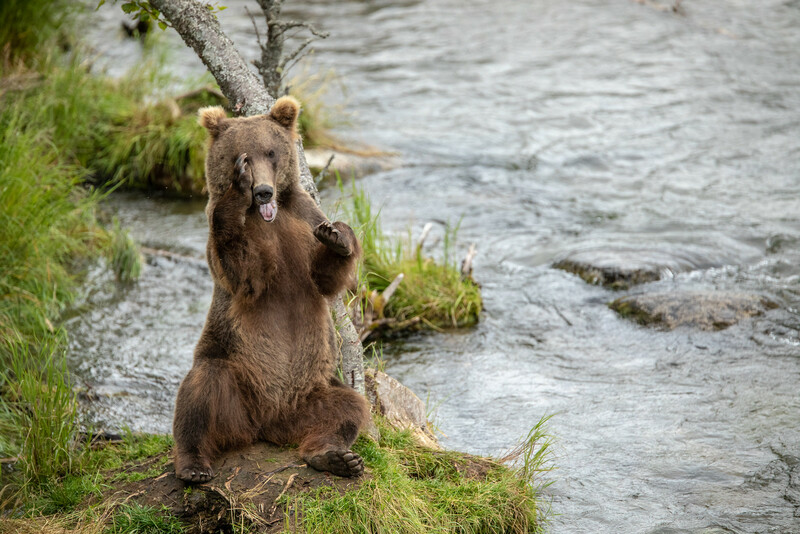 Here is a photo of her approaching another bear that just caught a fish. 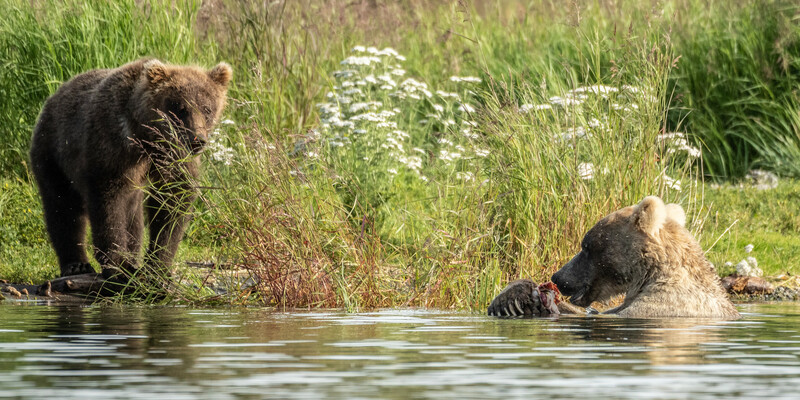 In the photo you can see some blood dripping from the just dropped fish at the top, challenger in the middle, and her cub at the bottom. So she gets close enough to get them to drop the fish in order to challenge back, then in the next frame, her face is in the water looking for the fish. It’s also worth noting that she always approaches from down-river so the dropped fish goes towards her. 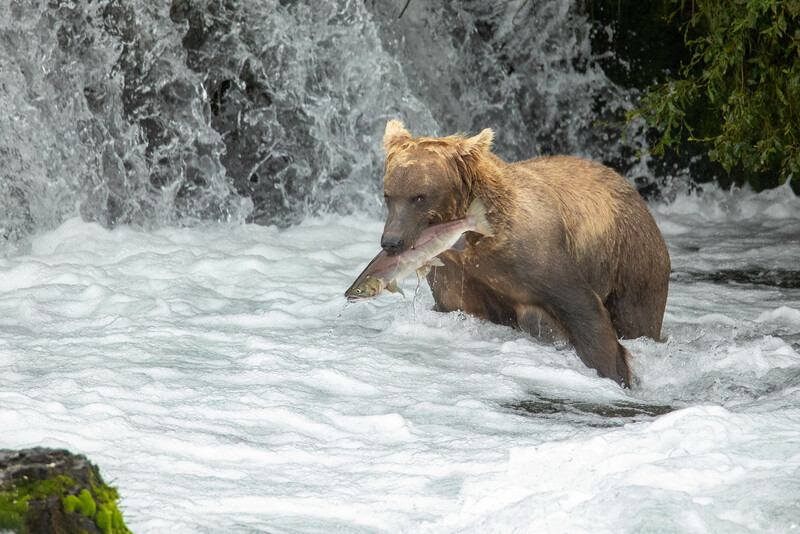 It’s not the worst fishing method I’ve seen, and it’s pretty fascinating to see how much the other bears tolerate her. Some of them just drop the fish when they see her coming. At the end of the evening, we left the platform with at least a dozen bears still around. 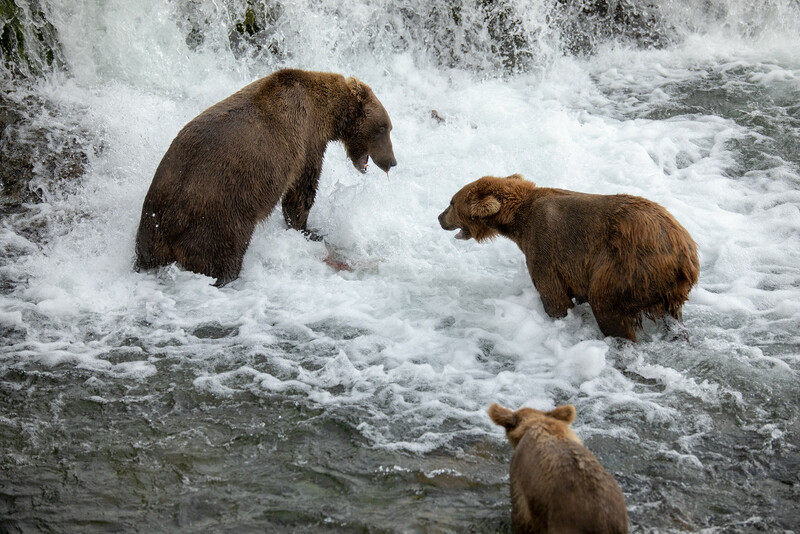 Today, Cody and myself embark on something that might go against common sense – we rent chest waiters and head into the very river teaming with bears. The river directly in front of the platforms is closed, but downstream is open to fisherman and anyone else bold (or stupid) enough to share the fishing territory with the bears. 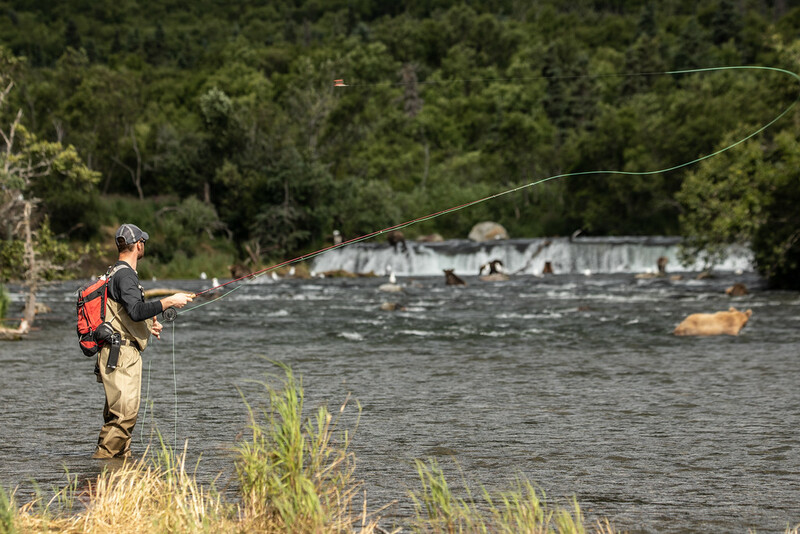 Cody wanted to throw a line in the river but (understandably) didn’t want to go alone. I’m happy to oblige and keep an eye on our surroundings (and take photos, of course). This allows me to get off the platform right into their habitat for some more intimate views. Again, going back to that eye-level preference. Being in this situation requires constant surveying of your surroundings. 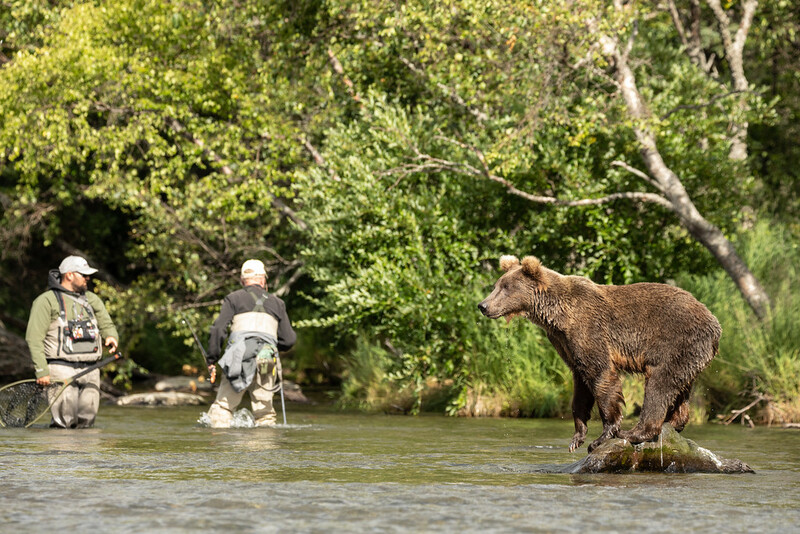 This isn’t the typical river fishing where the possibility of encountering a bear is in the back of your mind. 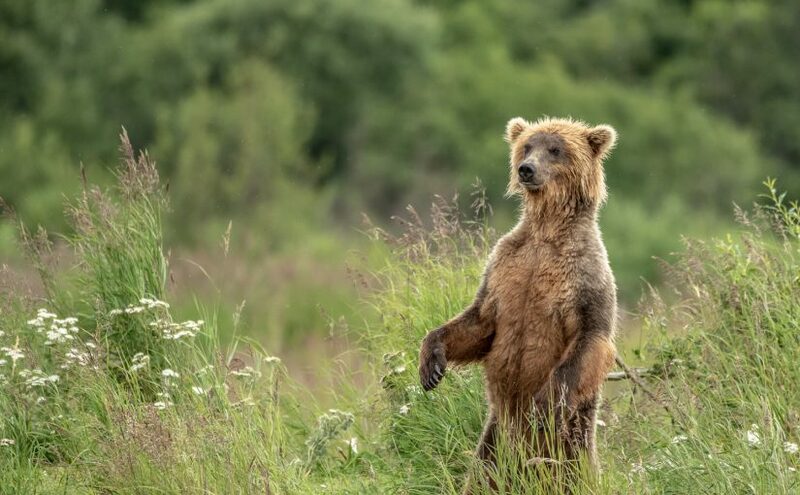 There are always bears around; all the concentration is focused on keeping track of them. As soon as we are in the river, the first bear to take note of is this mother w/ 4 cubs. 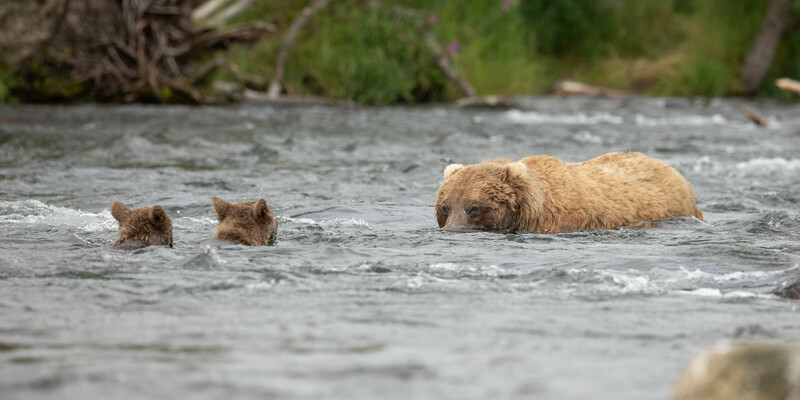 Bear families are a little easier to keep track of because the mother bear is pretty situationally aware. Generally she won’t explode into a run for fear of her cubs getting too far away. She also will usually keep a decent distance from people. Of course all bets are off when a sub-adult appears. 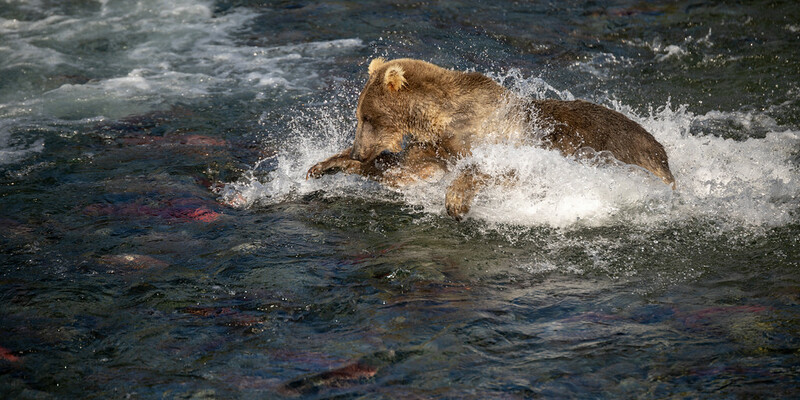 Younger bears will focus on a fish like a dog focuses on a squirrel. They will explode into chase seemly without warning and will close that 50yd distance in a matter of seconds. This is frighteningly said from experience. 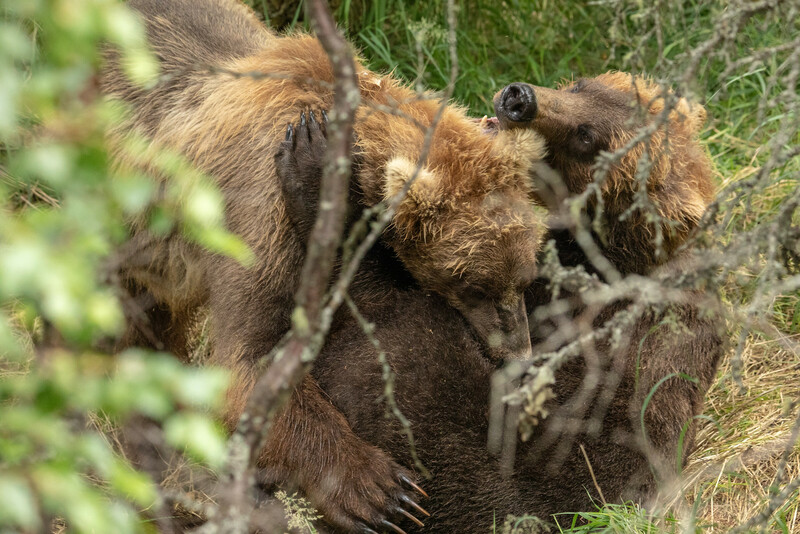 Cody and I had a young bear approach much to closely (25 feet), and it pinned us between another bear, so we didn’t really have an escape path. As soon as it looked up, a very firm “HEY!” got its attention, and it made a wide pass around us after that. As we waded down-river, it was more of the same. 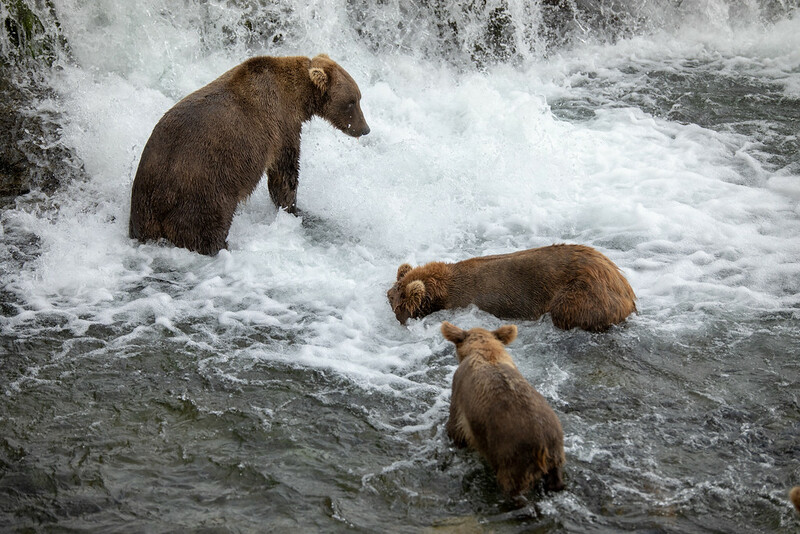 Bears passed by at various distances, finishing off with a nursing bear family. Now I get it – this all sounds nuts, and it was. Through the worst part is yet to come. 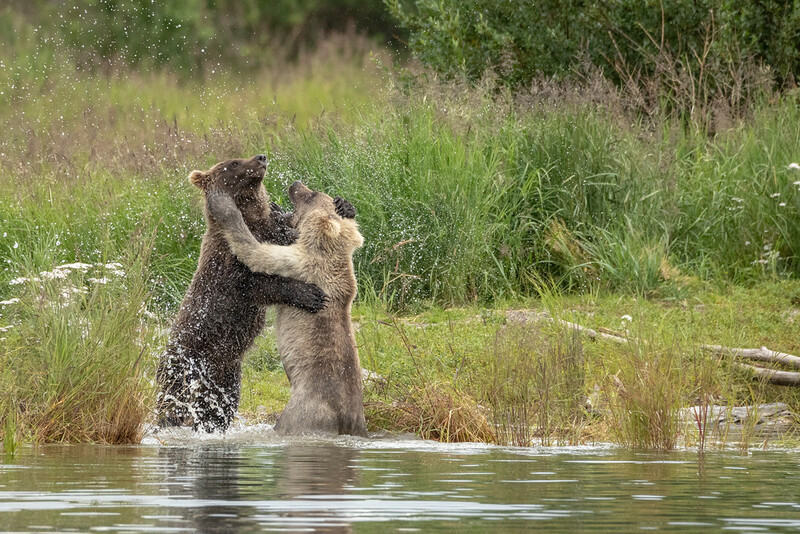 You see, the exit point from the river is right where this nursing bear is. And there is no (human) trail to get back to camp. The only option is to bushwhack through the tall grass, or find a small convenience in following bear trails. As you can see in the above photo, a bedded bear can be completely obscured by the grass. When hiking through Yellowstone, sometimes we forget to make extra noise in the off-chance we encounter a bear. Let me tell you, nobody forgot to call out during the next 20 minutes. 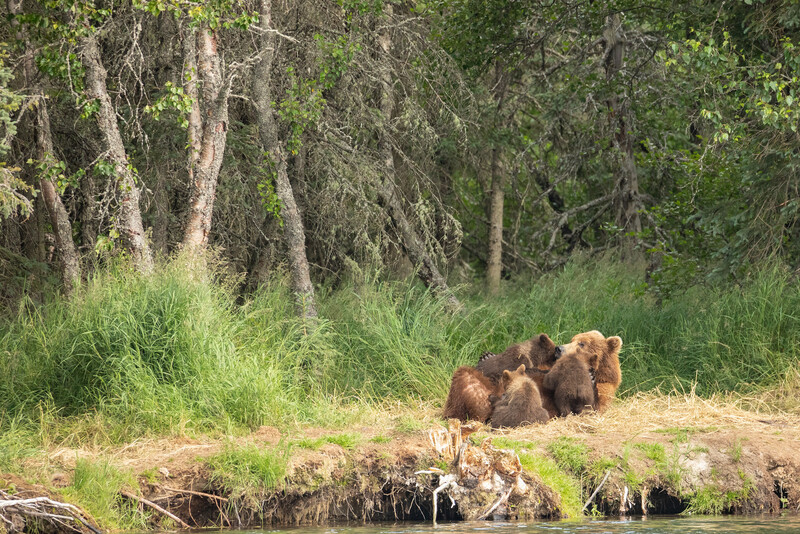 As soon as these bears finished nursing and moved on, we left the river and started heading towards camp. Both of us are familiar with hiking around GYE but this experience was right at the edge of our comfort zones. I hope you understand that no photos were taken this point in time. We were ducking through bear trails and finding several large bed sites. But no bears…something I was genuinely surprised about. We had time for a late lunch and afternoon siesta. Then it’s back to the falls. 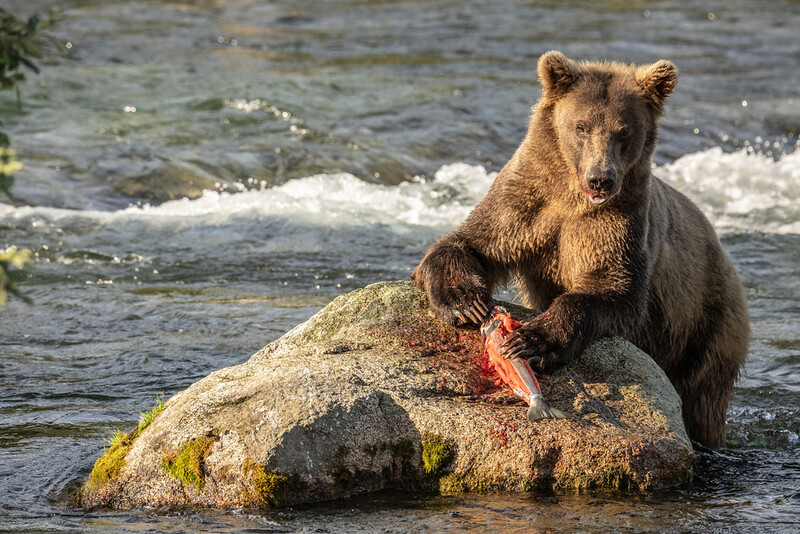 There wasn’t quite the number of bears as previous evenings, but the fish were certainly jumping. Also the sun came out, which was pretty rare weather for the week. The rental for the waiters were for 24 full hours, so we had them until around 10am. Cody and I decided to attempt a morning excursion. We scoped out the platform area to find a bear as sleepy as I was. 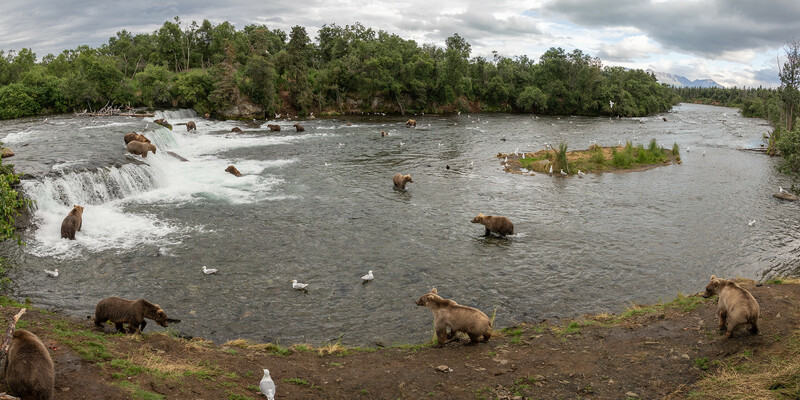 More importantly though was that there was too much bear activity at the river entry point for us to enter safely. So we walked back to camp. The day held off pretty cloudy so we went back to the falls midday. There were not many large males in the prime fishing spots, so some younger sub-adults were happy to fill in. Later on the sun came out which pushed us back to the lower river area. The long Alaskan days were starting to get to me. I headed back to the falls but didn’t make it past the covered pavilion. I decided to stop there and rest my eyes a bit. Within about an hour, I was awoken to the rustle of bears roughhousing under the platform. The rest of the evening was pretty routine. Plenty of catching shots and drama as the older males showed up and reclaimed their fishing spots taken over by the sub-adults earlier in the day. The day started off promising, but the forecast was not looking good. Steady rain soon moved in. One of the benefits of being here 7 days, is that having a rainy down day is not the end of the world. It’s a chance to relax, re-energize, and be ready for when the weather clears. But that’s not what I did. For most of the day I was out in the rain experiencing all weather conditions Alaska can throw at me in a week. Besides, what did I bring my rain gear for? The rest of the day was rainy bears and was mostly uneventful. I’ll move on to the next day in an attempt to keep your attention. Tim wants to rent waiters and walk the river. Again, I’m happy to oblige! Excitement comes when dressing up and walking down to the falls. It quickly ends when we leave the trail and start the bushwhacking down the anglers “trail”. I quote trail because we lost it a couple times – it’s not that defined. Probably because more bears frequent the area than people. We make it through unscathed and am greeted seemingly by the same sow with four cubs. This time though I notice a problem. My photos look off and the lens is having trouble focusing. Well, recall all the rain yesterday? I had rain gear, but my camera doesn’t. What happened was that my lens let water in through the zoom barrel and fogged up the inner lens element – CRAP! 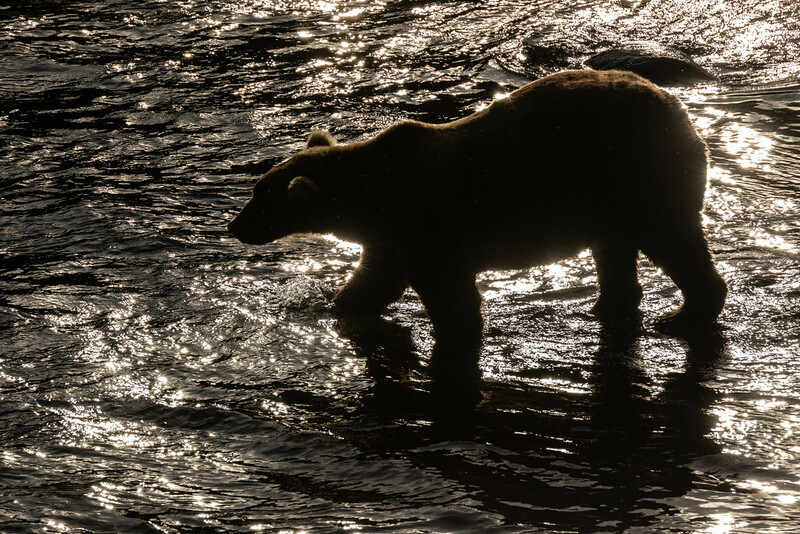 Not much I can do about it when standing in a river surrounded by bears. But I tried to remediate the problem anyway. With Tim keeping an eye out, I focused on drying out my lens. I took the lens off the camera and pointed it into the sun. 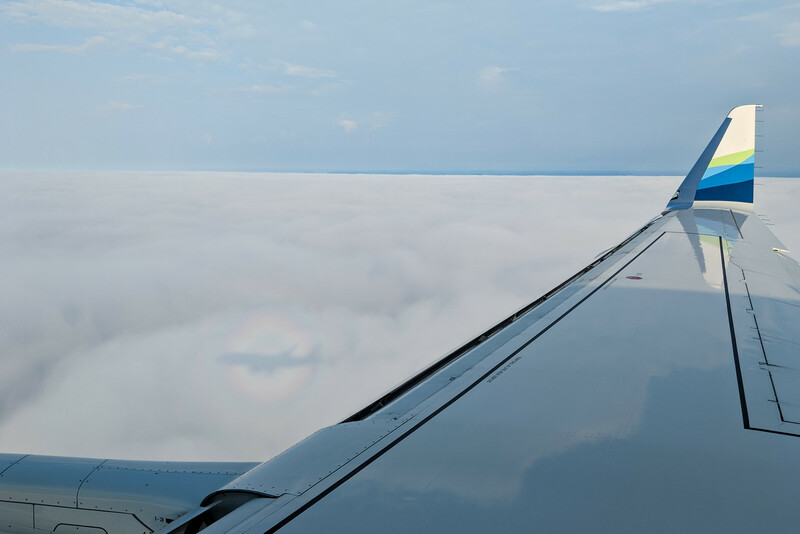 At the same time, I would extend and contract the zoom in a desperate attempt to dry out the air inside the lens and rid the fog. After about 10 minutes, it amazingly cleared up. Ok, lens back on and continue with the river walk. 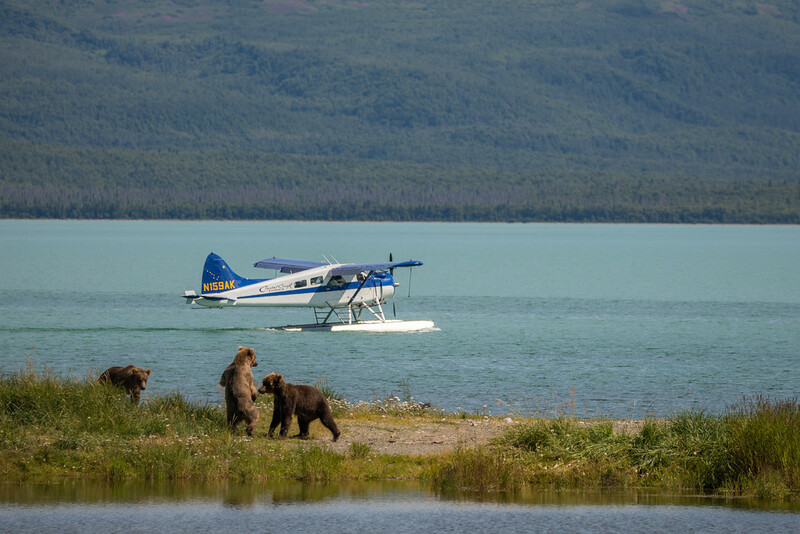 Here is a different sow w/ 2 cubs going on a fishing lesson. The rest of the walk continued with numerous encounters. In the effort not to turn this into a book (might already be too late), here is a pair of sub-adults to finish off the segment. Again, the trek from the river back to camp was a bit uncomfortable but no dangerous encounters. This evening is the last time at the falls. It was some of the best evening light we were missing all week. As we headed back to camp, Tim went in to the lodge, but I could not. It’s the last evening here, and the light continued to improve. I started wondering around camp and lower river enjoying the sunset. I spent quite a bit of time at the lower river platform…not taking pictures, just enjoying the evening. The last bit of solitude until heading back to reality. Heading back to camp, this is the last time I will cross this bridge…ever. 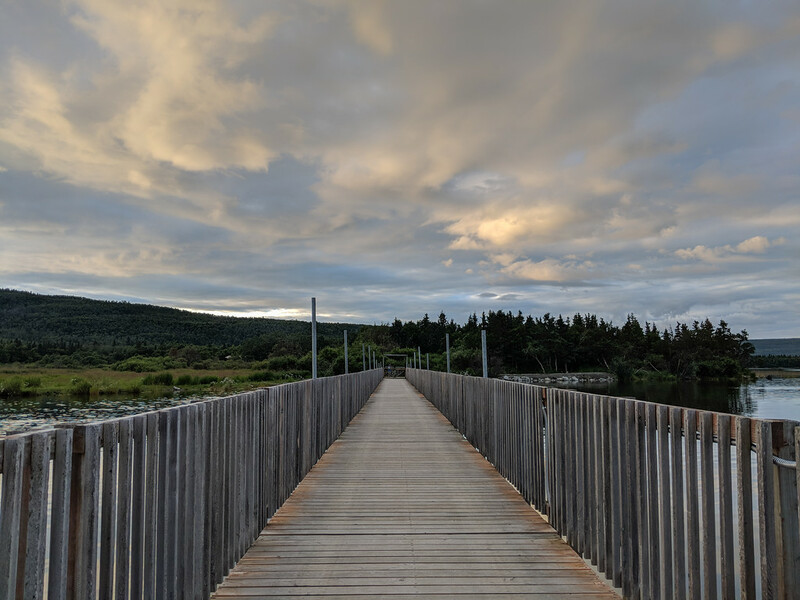 Yes, I do plan on returning to Brooks Camp, but this bridge will be removed this fall and replaced with a permanent structure. It makes me sad because this bridge is more intimately part of the landscape, and the future elevated bridge puts me above the wildlife, something I’ve said before is not preferred. 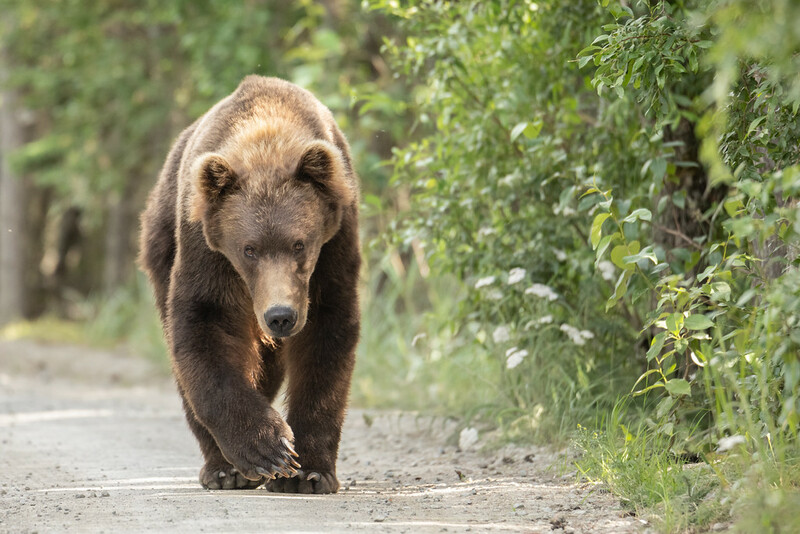 I don’t care that sometimes bears will be on the trail and might delay foot traffic for up to hours at a time. Who here is in a hurry anyway? But the reasoning is justified. 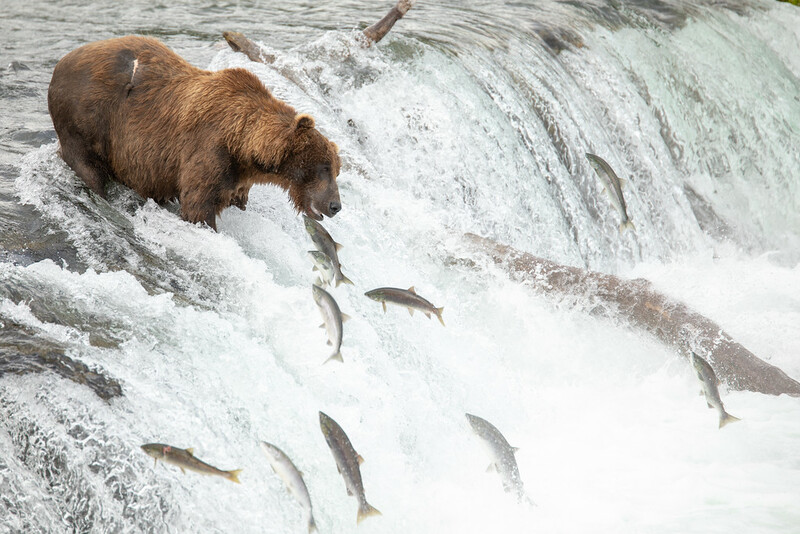 The floating bridge affects salmons’ ability to swim upstream and does affect the bears’ behavior at times. So fine, I will still grumble about it, but it’s probably the right thing to do. Just so we are clear, this is a CUB. 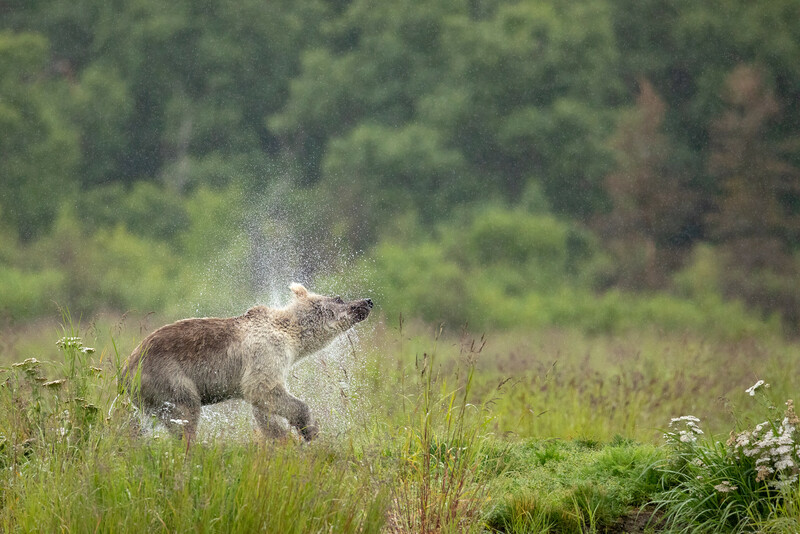 I recognize this bear right away as the darker cub of Bear 435 “Holly”. Yup, mother must be right around the corner. So it’s a slow hurry back to the bridge, close the gate, and wait a brief moment for the three of them to pass. Back at camp the slow sunset just gets better. 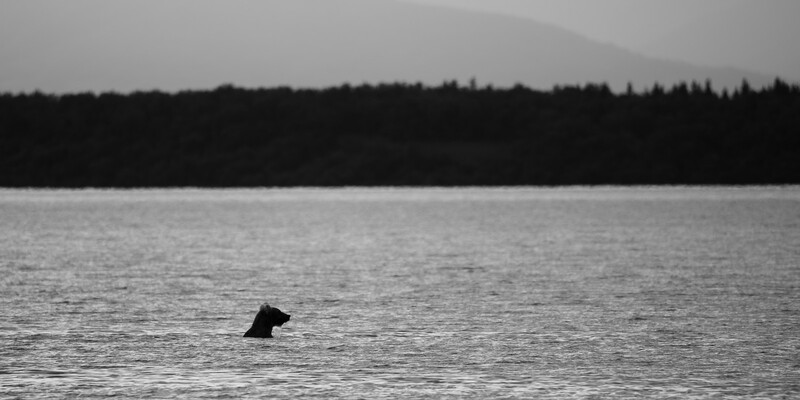 I’m sitting at the beach photographing the lake-shore when a young bear is spotted heading our way down the beach. It’s way too late for a portrait-like photo, but I had a different image flash in my head, and it seemed epic. But I only have one shot (pun intended) to get it right. I step away from the shore, get low, and expose for the sunset. Yup, I’m capturing a silhouette. In fact I’m done embedding any more photos in this blog post, because that one is my favorite. 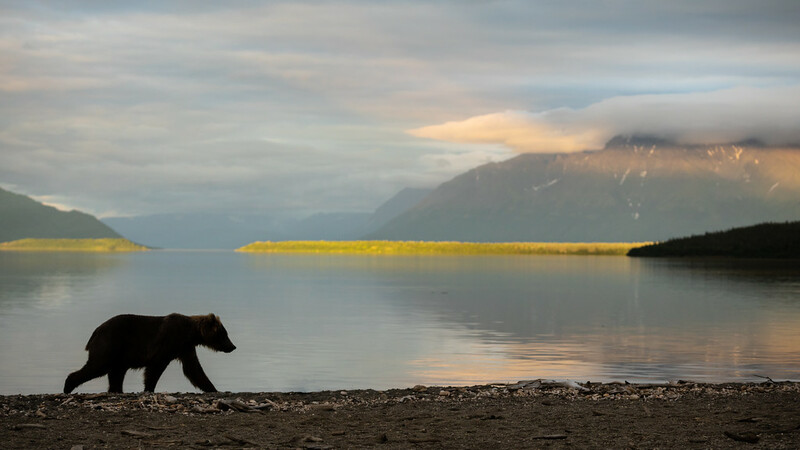 The evening had some more bears walking the shoreline, and I was able to get a shot of them through the electric fence – a personal novelty. If you want to see them and tons more that I skipped over, please flip through my album, linked below. Did you make it all the way to the end? I’m impressed! I like to document my trips for my personal journalism, and this one turned out to be a huge post. Thank you for sticking through to the end!